HERE is a superb and up to date site describing the development of, and evidence for, the Hockney-Falco thesis propounded by David Hockney and Charles Falco. The Hockney-Falco Thesis: Our thesis is that certain elements in certain paintings made as early as c 1430 were produced as a result of the artist using either concave mirrors or refractive lenses to project the images of objects illuminated by sunlight onto his board/canvas. The artist then traced some portions of the projected images, made sufficient marks to capture only the optical perspective of other portions, and altered or completely ignored yet other portions where the projections did not suit his artistic vision. As a result, these paintings are composites containing elements that are "eyeballed" along with ones that are "optics-based." Further, starting at the same time, the unique look of the projected image began to exert a strong influence on the appearance of other works even where optical projections had not been directly used as an aid. Below is a close-up from The Arnolfini Wedding by Jan van Eyck, painted in 1434. 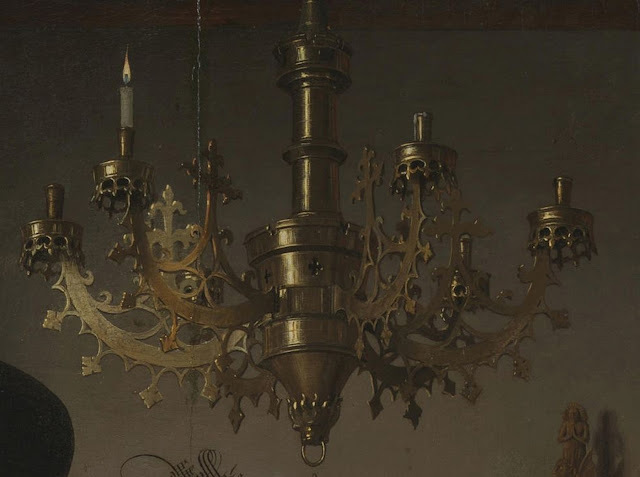 The detailed fore-shortening, shadowing and reflection of light captured in this image of a chandelier are all typical of an image that has been obtained via optical projection (probably with a concave mirror).